At Maggie's Farm, we tend to suspect that issues such as medical insurance, gun control, health, and climate fears are indeed Trojan Horse issues (as Coyote terms them), advocated to increase goverment control over our lives and to reduce our choices, freedom, and self-determination as free adults who are capable of managing our own lives, in our own ways - for better or worse. No, not "capable" - "endowed by our Creator" and our history with that privilege and that freedom. One must be suspicious of motives when vast, costly government-control solutions are offered to trumped-up or imaginary "crises." "We the people" are smart enough to figure it all out for ourselves, despite what the self-anointed "elite" might think: not one of the "elite" is better educated, or more worldly, than we ADD-victim redneck folks at Maggie's are. As we like to snobbishly say, "Who are these people?" The people who seek control are not necessarily evil: they no doubt believe that they are not only benign but virtuously-intentioned, and especially qualified to make decions for us. They almost certainly believe that they are more "caring" than I am. However, individual freedom does not enter into their equations as a caring virtue - or even as a virtue or American ideal at all. (We believe it to be a transcendent ideal, and a gift of God.) Hence what we view as the totalitarian or, as Goldberg and H.G. Wells would have it, "fascistic" proclivities of the Left. Since we at Maggie's view individual liberty, and the responsibilitities which accompany it, as an almost religious, if not religious ideal, we must view those who wish to diminish liberty as enemies of man and of human dignity. Are we paranoid about State power? Given human history, and the course of US history, we do not think so. Furthermore, we do not wish to rely on the judgement of anyone who wants to run any part of our lives. As Milton Friedman asks in this entertaining YouTube, "Where are these angels who are going to run my life for me?" "If men were angels, no government would be necessary. If angels were to govern men, neither external nor internal controls on government would be necessary." - James Madison, Federalist #51. No, we aren't anarchists. We do not object to drivers' licenses, or even hunting licenses. We will pay a fair share of taxes as a price of civilization. I do not even mind zoning if the people vote for it, and I am all in favor of national, state and local parks. But we are not willing to be "governed." That's where we draw the line. Being "governed" is for children (by "governesses"). Free citizens must learn to be self-governing as adults which, as our Dr. Bliss often reminds us, is no easy task but is a highly worthy and ennobling pursuit. It's all about where you draw the line for government intrusion into one's life. Some of us still want to be Americans, not Europeans. But that's enough pontificating for now. Top image: A photo of Westport, CT's Minuteman statue on Compo Road, near Compo Beach (via Dr. X). In my own, humble internet way, I want to continue our Minutemen's work and their radical ideal of individual freedom and responsibility in a country free of government tyranny. "We the people," (excluding those with their hands out) have more sense and more life experience than anyone in a government career, or any of the elites on the academic dole. Great post. Succinct. Well punctuated with quotations from classic thinkers. Thanks. I had fun with that one. If I may say; firstly, it's great stuff & is NOT pontificating, and secondly even it was pontificating, it wouldn't ever be "enough for now". Excellent. One can never be reminded enough as to what this country, and our freedom and liberty, are all about. Theoretically, the more democratically republican (or republicanly democratic?) a given power structure is, the more responsibly it�ll function. It�s self-correcting and will tend to err on the side of competency, since the benevolent dictators and malignant narcissists who are temperamentally compelled to climb power ladders will have to play by rules and under watchful eyes. such as, turning the press -- the vital watchdog enshrined by the Founders in the First Amendment as the key to making your observation functional -- into an array of extremist nich-marketers. Sometimes in business no news is good news. But in the MSM business good news is no news. I was struck by the dynamic posture of the Westport Minuteman, so i tried to get more info on the piece. Lite search yielded little as to artist, but did find interesting note in the wiki on the town, the soldier is facing inland, due to the Westport minutemen's tactic of allowing the British to land, then closing behind them to cut them off from the sea (and their supply, presumably). and BTW, Westport is where Ricky and Lucy Ricardo and Darrin and Samantha Stephens all lived. Wonder if they knew each other? advise, stay out of wikis! The Brits did land and burn along the Fairfield County coastline. Burned my family's church - rebuilt in stone, like the three pigs. Had a girlfriend from Fairfield, as a lad, with the burn marks in the old kitchen. They had been covered up, but her family uncovered them as a reminder of the fight. The owners ran off, but ran back to put out the fire. Torys, no doubt, like many if not most Yankees. 1777: Westport's Compo Beach was the site of the British invasion of Danbury, also known as Tryon's Raid. 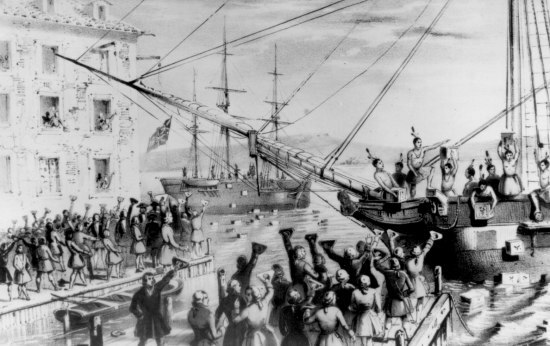 British troops land at Compo Point; proceed north to burn supplies and ammunition at Danbury, Connecticut. Excellent work, NJ. I'm passing this around to the unconverted family members in need of reinforcement. Despising the compassion of war on drugs, thinks terrorists dispensing illegal drugs to bankroll their jihads ought be cut a break. "What I personally imagine, in other words, is a world of love and freedom, and I believe that Lennon � like many others of his generation � was very close to imagining such a world as well. Would John have gotten there, at some point? We�ll never know. For now, all we can do is take up where he left off." Glenn, me thinks, y'all ought find a hide of your own and leave Yoko be. That is not his view. He is being ironic. My irony meter may be malfunctioning. Alleged reason: Compassion, expressed by protecting us from ourselves at gunpoint, because pot and other drugs are dangerous. Well, we were TOLD that marijuana is dangerous; in fact, its safety record is exceptional; far better than that of prescription drugs. Love and freedom are a connected duality, and each half only works with help from the other. Our job is to move that thought, and eventually that understanding, into people�s minds as widely and quickly as possible. The free and compassionate world � the secret world of our hearts � depends on it. Life itself on this Earth may depend on it. The Boomers stumbled and failed here; their children and grandchildren must not. And in case folks have forgotten the warnings of the Anti-Federalists... the concept of democracy being local, of knowing your actual representatives to federal government, of ensuring that turnover be set and frequent: these are the hallmarks to keep your liberty. "In order for the people safely to repose themselves on their rulers, they should not only be of their own choice. But it is requisite they should be acquainted with their abilities to manage the public concerns with wisdom. They should be satisfied that those who represent them are men of integrity, who will pursue the good of the community with fidelity; and will not be turned aside from their duty by private interest, or corrupted by undue influence; and that they will have such a zeal for the good of those whom they represent, as to excite them to be diligent in their service; but it is impossible the people of the United States should have sufficient knowledge of their representatives, when the numbers are so few, to acquire any rational satisfaction on either of these points. The people of this state will have very little acquaintance with those who may be chosen to represent them; a great part of them will, probably, not know the characters of their own members, much less that of a majority of those who will compose the foederal assembly; they will consist of men, whose names they have never heard, and whose talents and regard for the public good, they are total strangers to; and they will have no persons so immediately of their choice so near them, of their neighbours and of their own rank in life, that they can feel themselves secure in trusting their interests in their hands. The representatives of the people cannot, as they now do, after they have passed laws, mix with the people, and explain to them the motives which induced the adoption of any measure, point out its utility, and remove objections or silence unreasonable clamours against it. � The number will be so small that but a very few of the most sensible and respectable yeomanry of the country can ever have any knowledge of them: being so far removed from the people, their station will be elevated and important, and they will be considered as ambitious and designing." "In what manner then will you be eased, if the expences of government are to be raised solely out of the commerce of this country; do you not readily apprehend the fallacy of this argument. But government will find, that to press so heavily on commerce will not do, and therefore must have recourse to other objects; these will be a capitation or poll-tax, window lights, &c. &c. And a long train of impositions which their ingenuity will suggest; but will you submit to be numbered like the slaves of an arbitrary despot; and what will be your reflections when the tax-master thunders at your door for the duty on that light which is the bounty of heaven." "But as it is by comparison only that men estimate the value of any good, they are not sensible of the worth of those blessings they enjoy, until they are deprived of them; hence from ignorance of the horrors of slavery, nations, that have been in possession of that rarest of blessings, liberty, have so easily parted with it: when groaning under the yoke of tyranny what perils would they not encounter, what consideration would they not give to regain the inestimable jewel they had lost; but the jealousy of despotism guards every avenue to freedom, and confirms its empire at the expence of the devoted people, whose property is made instrumental to their misery, for the rapacious hand of power seizes upon every thing; dispair presently succeeds, and every noble faculty of the mind being depressed, and all motive to industry and exertion being removed, the people are adapted to the nature of government, and drag out a listless existence. If ever America should be enslaved it will be from this cause, that they are not sensible of their peculiar felicity, that they are not aware of the value of the heavenly boon, committed to their care and protection, and if the present conspiracy fails, as I have no doubt will be the case, it will be the triumph of reason and philosophy, as these United States have never felt the iron hand of power, or experienced the wretchedness of slavery." Not that we were amply warned about the harm of federal government with democracy so limited that it would engender a class of individuals that saw themselves as deserving of having their position because they would be removed from the People by lovely districts of 1:500,000. Oh, heavens, no this was not seen as a problem that would happen and warned about. "It is to be regretted that the rich and powerful too often bend the acts of government to their selfish purposes. Distinctions in society will always exist under every just government. Equality of talents, of education, or of wealth can not be produced by human institutions. In the full enjoyment of the gifts of Heaven and the fruits of superior industry, economy, and virtue, every man is equally entitled to protection by law; but when the laws undertake to add to these natural and just advantages artificial distinctions, to grant titles, gratuities, and exclusive privileges, to make the rich richer and the potent more powerful, the humble members of society the farmers, mechanics, and laborers who have neither the time nor the means of securing like favors to themselves, have a right to complain of the injustice of their Government. There are no necessary evils in government. Its evils exist only in its abuses. If it would confine itself to equal protection, and, as Heaven does its rains, shower its favors alike on the high and the low, the rich and the poor, it would be an unqualified blessing. In the act before me there seems to be a wide and unnecessary departure from these just principles. Nor is our Government to be maintained or our Union preserved by invasions of the rights and powers of the several States. In thus attempting to make our General Government strong we make it weak. Its true strength consists in leaving individuals and States as much as possible to themselves in making itself felt, not in its power, but in its beneficence; not in its control, but in its protection; not in binding the States more closely to the center, but leaving each to move unobstructed in its proper orbit." Indeed, lets make the government the supporter of society... and forget that it is not made for that, but to restrict the excesses of individuals and other Nations. Let us make everything 'fair', but unjust. Liberty is created by one's own hands to prosper or not as best one can. The society has a responsiblity to the poor and destitute and charity is not for government but begins at home and in society, with government the last and least capable thing ever created to be *kind*. Government is not *kind*, it is a punisher, a task master, a restricter and it had best do those things equally without regard to money or stature so that all are treated equally from beggar to bigwig. But then I see these warnings, and well-placed at the founding and thereafter, and take them seriously as they describe other democracies and republics and societies that have failed in these endeavors. And when I look around and see them coming about one-by-one I read onwards to find that the end of such things is not liberty but tyranny. ajacksonian: a thomas paine for our times! And yet AJ... and how could any man argue your points. What is the way forward? The strength and independence of the agrarian class is gone, for the most part suckling on the government teat. And was that class not the bedrock of the framers in their deliberations. We all, most of us anyway, sit comfortable, fat dumb and happy as the saying goes. While our freedoms evaporate as a Frisco fog under a hot sun. I'm afraid that, except for war, there is not much hope for continuation. That the pendulum will continue its fateful swing. Elect his estimation of a great freedom fighter. Shaw percieved abolition of private property a means to liberty. Like Wells he was a communist before the word took meaning. Perhaps, but you have become entranced with the ranting and enamored with your own voice. You argue loudly for 'freedom' which seems to mean--your freedom to do as you want and leaves nothing for anyone else whose freedom may involve better health, freedom from fear, freedom to work, etc. bboot, sorry, but lost on me is the distinction between your idea and the one you dispute. Might you elucidate? If in lieu of your quick elucidation I may infer the likely answer, I'd like you to consider the amount of taxpayer contribution that is already being paid by able & willing producers toward the permanent funding, for those unable or unwilling to so fund with their own capital & labor, those particularly-circumstanced freedoms of which you (likely) speak. Those things, while good, are not political freedoms as usually conceived. Indeed, some folks just want to be free to smoke pot and/or snort coke and/or crank. While, others will to elect representatives who will work to secure all individuals' right to be free from criminal organizations that supply the libertine's mind numbing favorites. Indeed -- any of us of any political persuasion could design a personal list of freedoms. A good title for it would be "My Personal Utopia". Buddy boo, anticipation builds for your forthcoming book. Some therapists say, revealing your mind numbing favorites can be cathartic and a step forward on road to recovery and reintegration. LOL -- put it this way -- if it's really really bad for your physical and mental health, I have at one time or another run it completely into the ground and broke it off. However, when the kiddos started popping up, I slowly and regretfully put away them childish things. Age 15 to 25 is a complete blank, tho --tho i played enough high school ball to cripple both legs, because i wuz usually cranked up on greenies and didn't know what "that really hurts" meant. Those were the days my friend, i was afraid they'd never end. RE:" anticipation builds for your forthcoming book." Agreed. Hope it is in the works Buddy. Nice job once again NJ. I enjoyed this one very much. Liberty and responsibility are flip sides of the same coin. When government relieves us of one side the other side surely follows. "Liberty and Tyranny" by Mark Levin makes a good gift for your son or daughter on Tax Day April 15th, when you will be attending a Tea Party near you. I'm going to the one in Missoula, as it's a sales tax free state and can pick up some stuff while I'm there. What part of "unalienable rights" do the self-proclaimed elites not understand?